After crocheting simple blankets and scarves, I wanted to challenge myself to tackle something different with my needle and yarn. 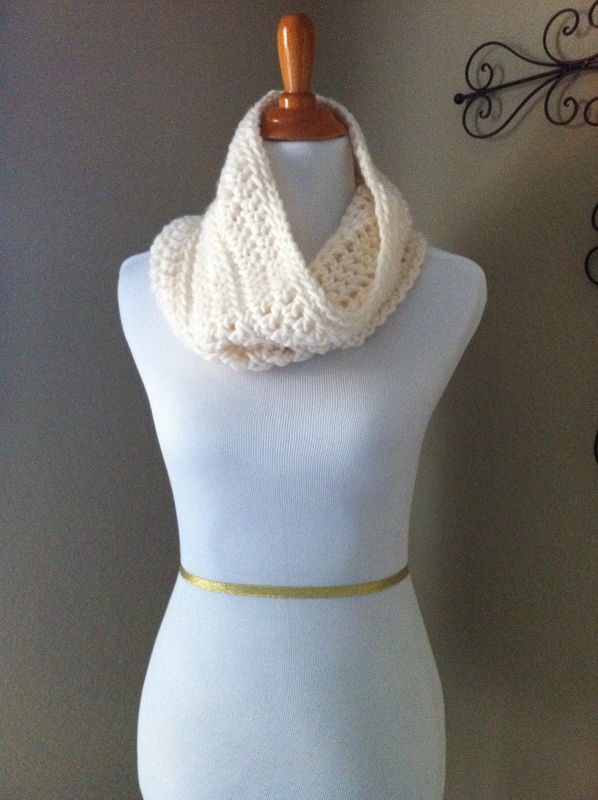 I love the feel of a soft chunky scarf so I searched for a cowl pattern that would give me that. I came across one I really liked at elletrain knits but modified it slightly to my liking. I used a jumbo hook size P, which is the largest crochet hook I could find at my local craft store. As for the yarn, I find anything with more than 20% of wool becomes a bit uncomfortable against my skin. Lion Brand Wool-Ease Thick & Quick brand is a perfect with 80% acrylic and 20% wool. It’s still super soft and bulky and combined with the larger hook makes the perfect cowl! I can get 1 cowl out of 1-2 skeins of 108 yds of yarn depending on how wide I would like the finished product. Here’s the simple pattern I used for anyone else who has some yarn and a bit of free time. Join chain into a ring with a slip stitch, being careful not to twist the chain. Round 1:sc in same chain as slip stitch, sc in each chain around. Join with slip stitch to first sc of round. Round 2: dc in same stitch as slip stitch and in each dc around. Join with a slip stitch to first dc of the round. Round 4: sc in same stitch as slip stitch and in each dc around in the back loop only. Join with slip stitch to first sc of round. For the next series of rounds, continue by repeating rounds 2-4 until desired width is reached. desired width is achieved. The more rows, the chunkier the cowl will be. The cowl shown above repeats rounds 2-4 an additional 2 times. **For very last round, sc in each dc in both loops, join with slit stitch to first sc of the round, bind off. This project works up very quickly, giving an almost instant sense of satisfaction! I have my stack of cowls waiting for winter time to come around again. Hi there! Thanks for reading my post. Are you crocheting in the round? It sounds like you’re turning your work and not in the round like I did for mine. It could be done either way and then just joined at the end if not joined at every step. If you are joining at every step, then at the beginning a double crochet up would be appropriate. If not joining but turning, you are correct that a dc would be needed before turning your work and starting the next row. I hope that’s not confusing and answers a little bit of your question! I so appreciate your response! I am not a very experienced crocheter…so unfortunately, I am still a little confused! To answer your question, I am working in the round. So I am basically just following along in a growing spiral, not turning, or chaining up. I suppose I could just continue and see where it goes? Since I am not a very good crocheter, I always struggle when I get to the ends/last stitch…! Thanks so much for your help. I really appreciate it! I think one reason why the ‘tube’ might start to take funny shape as you go could be at your first crochet of each round… Are you doing up the first DC and then skipping the first crochet underneath it to start? If you’re not skipping that very first crochet and crocheting into it, it could cause the number of crotchets to grow 1 in each round. Skipping it and starting the round in the next stitch, keeps the number of crotchets the same as you go up. Just as if you were doing a regular DC in a blanket and turning to start a new row, the first stitch would be skipped. I really really hope that answers your question this time. Oh, and I always try you tube for video instructions on how to do something I’m not too familiar, with or a stitch I’ve never done before. What were the measurements for your cowl? Hi there! The scarf can be made in any size desired. If I remember correctly the dimensions of this finished scarf was about 30 inches around in circumference and about 12 inches wide. Measurements can vary depending on yarn used and desired fit.